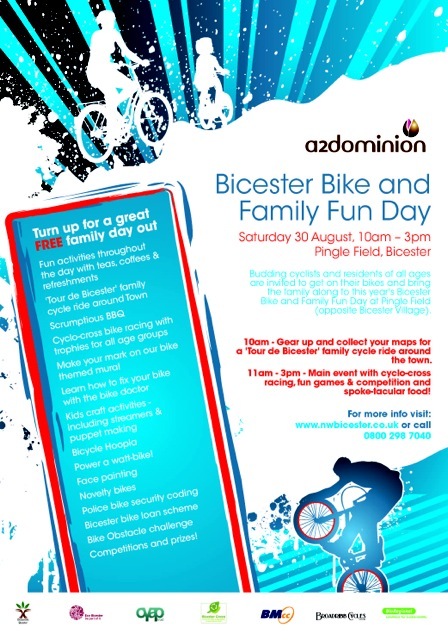 The third annual Bicester Bike and Family Fun Day at Pingle Field (opposite Bicester Village Shopping) will be held on Saturday 30 August between 11am and 3pm. This FREE event will kick start at 10am with a ‘Tour de Bicester’ family cycle ride around the town, with participants collecting answers from yellow jerseys along the route ready to complete a Tour de France themed quiz at the final leg! A delicious BBQ and whole host of activities will then take place back at Pingle Field (Pingle Drive, Bicester, OX26 6WB) at 11am. Following the success of last year, Bicester Millennium Cycle Club (BMCC) will be running another exhilarating cyclo-cross with races for all age groups to experience an exciting and challenging off road course with twists, turns and ramps to compete for trophies. Cycle repair expert – Broken Spoke – will be on hand to teach cyclists how to diagnose and fix their bikes and budding young artists will be able to make their mark on a bike themed mural. There will be a whole host of other activities including craft activities for children such as bike streamers and puppet making, face painting, and novelty bikes on display. Thames Valley Police will be offering free bike security coding to all bike owners on the day, and those without a bike can find out about how to loan a bike in Bicester from Bicester Green’s cycle loan initiative, while taking part in the bike obstacle challenge! The event is organised by North West Bicester developers, A2Dominion, working in partnership with, BioRegional, Grassroots Bicester, Cherwell District Councils Eco Bicester Team, Bicester Green Reuse Centre, Bicester Millennium Cycle Club and Broadribbs Cycles.